Last fall Fortress Press published the final volume (17) of Dietrich Bonhoeffer Works, English Edition (DBWE): Index and Supplementary Materials which provides a handy reference for readers and interpreters of Bonhoeffer who seek to better utilize and understand the first 16 volumes of DBWE. Fortress Press published the first volume of DBWE (Volume 5: Life Together and Prayerbook of the Bible) some 20 years ago. Since then significant advances in technology have permitted access to and interaction with texts in a way that few likely envisioned at the time. 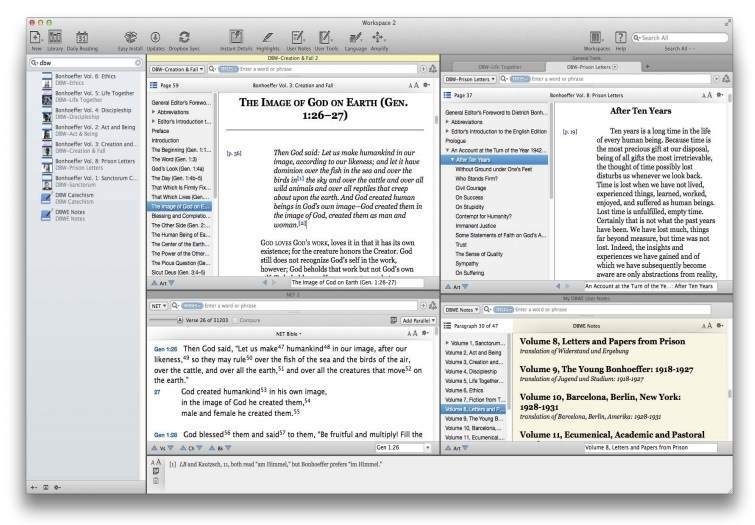 In the first half of 2014, three Bible software platforms - Accordance, Logos, and Olive Tree - each released 16 volumes of DBWE, available individually or as a collection in each of the three platforms. The following review assesses Dietrich Bonhoeffer Works, English Edition, as the Works appear in Accordance, version 11, and Logos, version 6. First, there is a description and analysis of DBWE in Accordance; then a similar evaluation of DBWE in Logos. This review also includes some comparison of the two platforms, with emphasis on how each has produced the 16 volumes. In concluding remarks, there is information about how to access Accordance11 and Logos 6 software programs. Any Accordance resource is automatically integrated with other Accordance resources a user may already own or could purchase. It is easy and nearly instantaneous to select and look up a word from a text (e.g., DBWE) in another module (e.g., the Anchor Yale Bible Dictionary). One could in this way research concepts and passages from Bonhoeffer in other biblical studies reference material. Accordance is unique among Bible software in that its multiple search fields allow a user to hone a search in to just section headings, just text, just Scripture references, or even Greek and Hebrew content, among other search fields. For example, one can quickly get to Greek and Hebrew content in Creation and Fall (DBWE 3) using “Greek Content” or “Transliteration” search fields, respectively. The many Scripture references and footnotes in DBWE are hyperlinked in Accordance. The user can hover over or click on hyperlinks to reveal their content. A user can open this information in a new window, view it as a popup, and see it in the "Instant Details" panel. Though the DBWE series uses the NRSV, an Accordance user could set any other Bible version to display by default when selecting Scripture hyperlinks. Accordance allows the user to set up and save a “Workspace,” so that one’s layout of resources is accessible for later use. There is even the option to save a “Session,” which is a collection of individual Workspaces. Figure 1 (page 6) is one possible way of configuring a DBWE Workspace in Accordance. As with Accordance, Scripture references and footnotes throughout DBWE in Logos are hyperlinked. The user can hover over a verse reference to have the text of that verse come up in the user’s version of choice. Or a user can hover over a footnote to make its content appear. One can also keep open Logos’s Information panel, which automatically displays both Scripture and footnote hyperlinks as the user works through the text. In addition to 16 volumes of DBWE, Logos has produced additional works in the field of Bonhoeffer studies, with even more in pre-production stages. For example, Logos plans to release Eberhard Bethge’s biography in the future, as part of a 7-book “Bonhoeffer Studies Collection.” Users of Logos can already purchase a 3-book “T&T Clark Studies on Bonhoeffer” collection, which includes Ferdinand Schlingensiepen’s biography of Bonhoeffer. Logos permits the user to set up and save a “Layout,” which one can later access easily. Whether the user wants to view multiple volumes of DBWE at once, and/or have them open alongside other works about Bonhoeffer, Logos has flexible customization options available. See, for example, Figure 2 (page 7). The hyperlinking in Logos is extensive. A footnote in Logos’s DBWE that itself has an additional footnote or Scripture reference has that nested reference also hyperlinked, so that one can stay within the same, initial pop-up window to see the content of a second footnote that appears in an initial footnote.